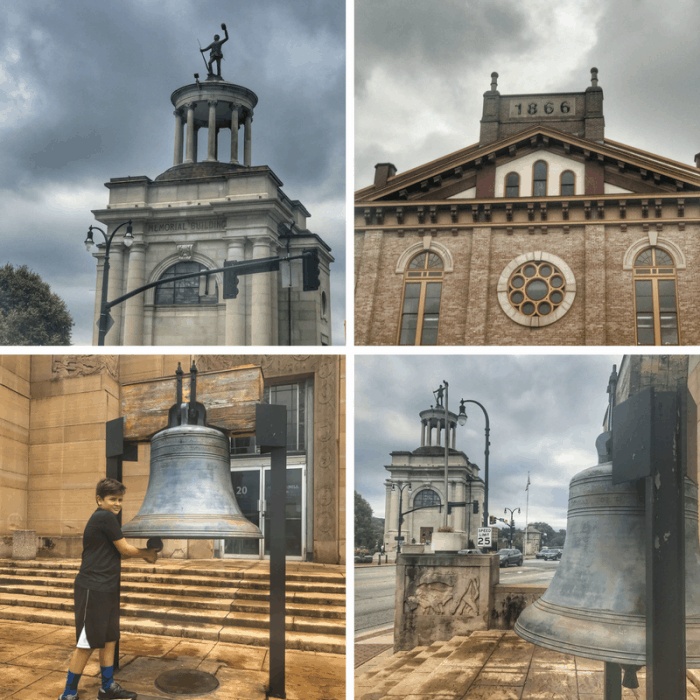 My visit to Hamilton, Ohio really left an impression on me. It’s a city that’s in the midst of a comeback. The downtown reminded me of what we witnessed in neighborhoods around Vine Street in the Over the Rhine neighborhood in Cincinnati several years ago that still continues to evolve. Hamilton is ripe for change. There is something special going on here. The first indicator, the artisans. A resurgence in a city is led by the artisans and visionaries. They create and bring new life to old bones. You had me at ART! 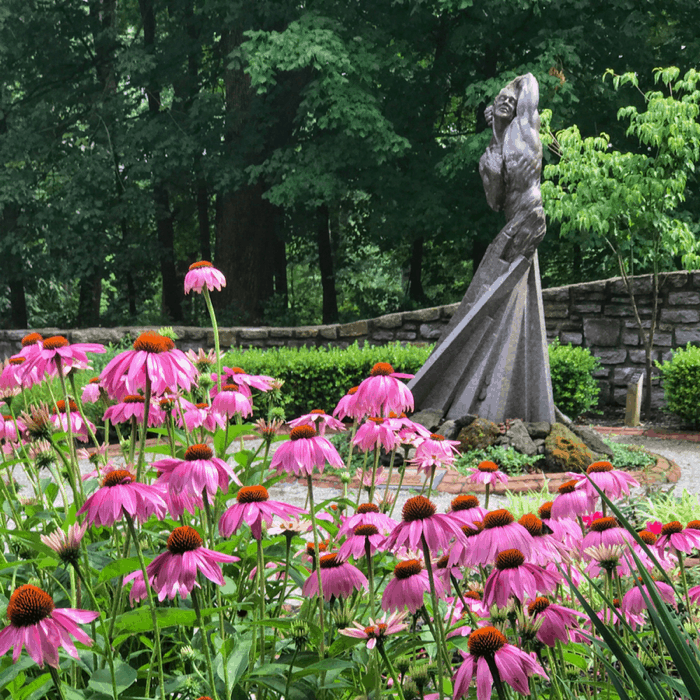 When I visit a city that showcases incredible art, my heart skips a beat a little. 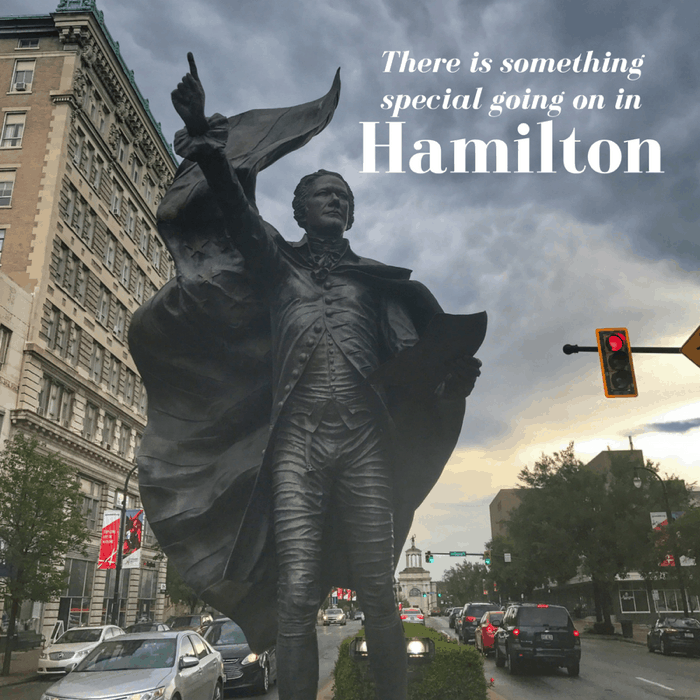 You don’t have to look far to find it in Hamilton. If you are familiar with my story, you know that my mom was an artist and my brother had cerebral palsy. I think that I definitely got my appreciation for art and my eye for photography from my mom. That made walking into Inside Out Studio such an emotional experience for me. I’m not much of a public cryer, but on the inside I was because what they are doing there is SO special and brings to light the talents and value of a community that can often be discarded or forgotten. This place also reminded me of a non profit studio I volunteered at in Grand Rapids, Michigan called Heartside Gallery. 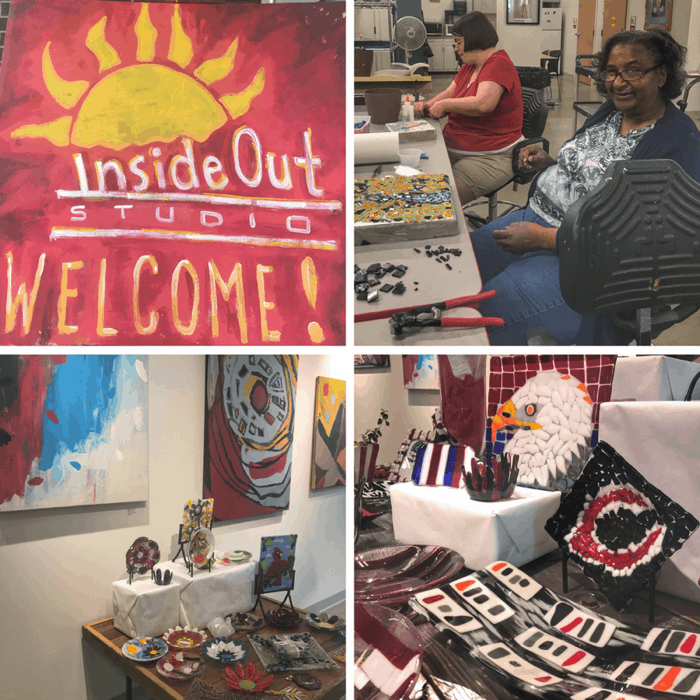 Inside Out Studio provides an opportunity for artists with disabilities to produce, market, and receive an income from their art; while gaining confidence in their abilities. There about 40 artists who regularly visit the studio. 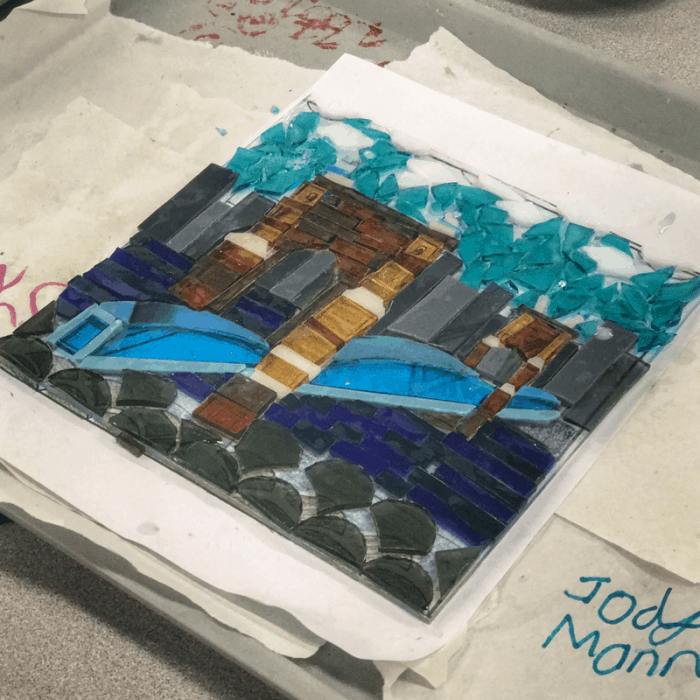 They receive guided instruction from professional artists in a variety of mediums. The materials at the studio are provided for the artists to use and retail space is connected to the studio space downtown. 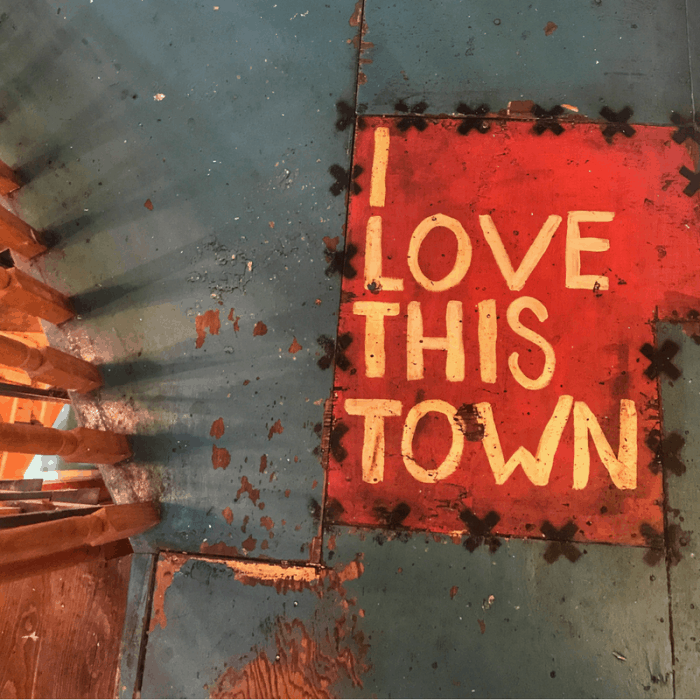 When you make a purchase at Inside Out Studio ,the artist receives 50% of all their artworks sold, the remaining 50% goes back into the studio budget to pay for operational expenses. You are investing back into the community of artists with disabilities and can even commission a piece of original artwork from one of the artists with 30 days notice. 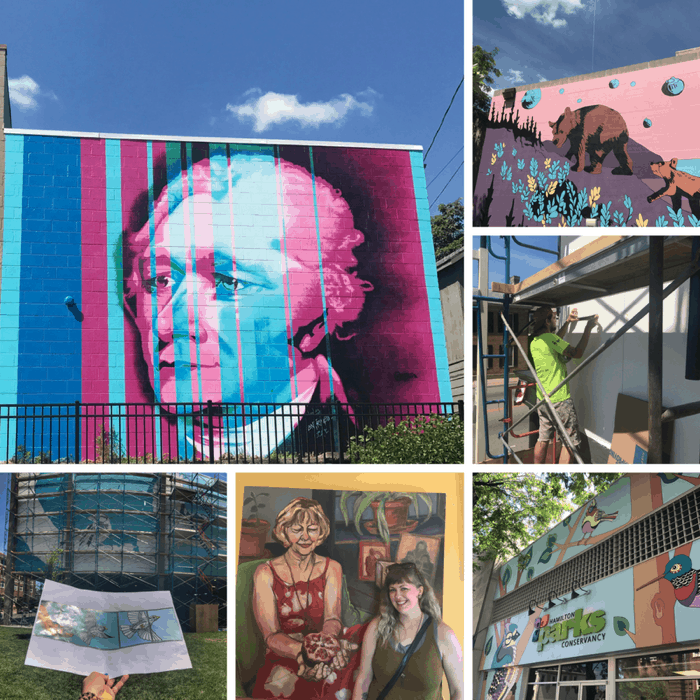 Thanks to the Street Spark program, the streetscape in the downtown Hamilton is changing with vibrant mural projects. 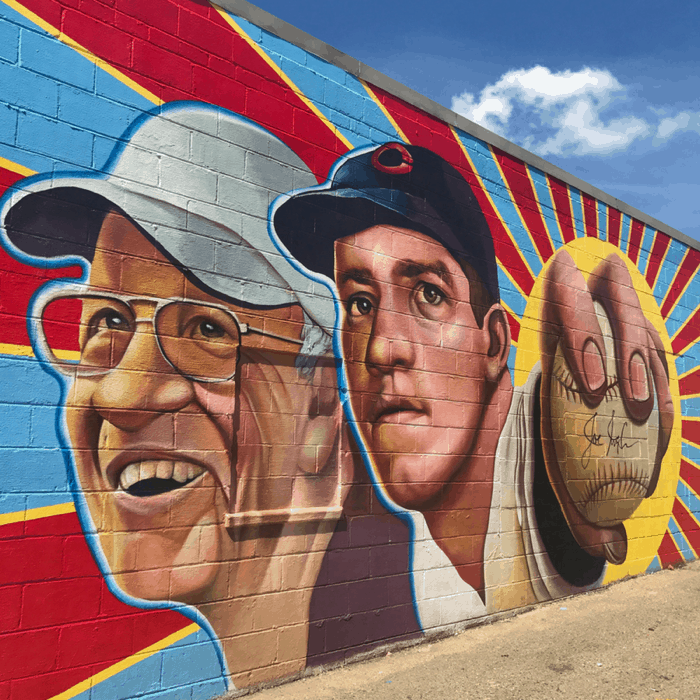 During our visit we viewed two mural projects that were in the works with project manager, Jenn Acus-Smith. She is pictured above with her painting of her grandmother on display at True West Coffee. 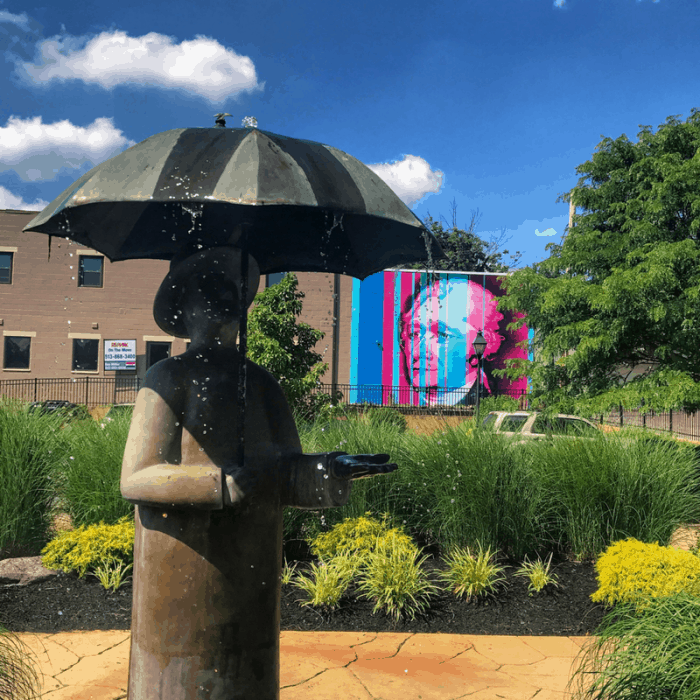 She also designed the mural for the Hamilton Parks Conservancy pictured to the right and her husband, Stephen Smith was the lead artist for the “Make Way for McCloskey” mural. (A portion of the mural is pictured in the top right corner) He is also the art education coordinator at Inside Out. I really enjoyed the behind the scenes look into tedious work involved by multiple artists to bring a design from concept to the side of a large building and I can’t wait to come back to see the finished results. 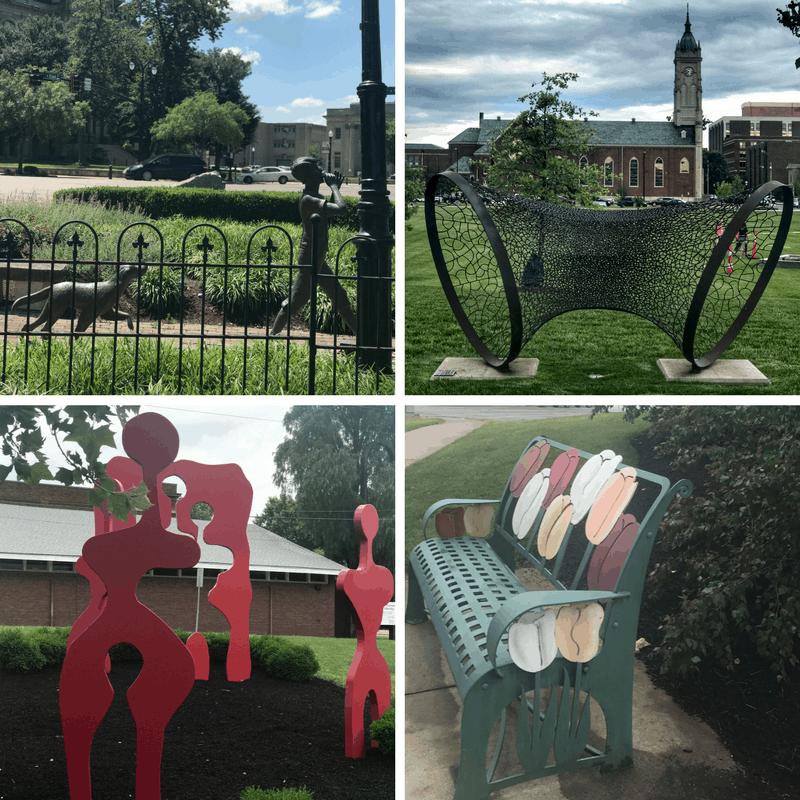 Hamilton was declared a “City of Sculpture” by Ohio’s Governor in 2000 with over 40 sculptures in a wide range of styles located throughout the city. You can locate them here. To enhance your experience, download the free mobile app Otocast for audio narratives provided by many of the artists downtown and at Pyramid Hill Sculpture Park. 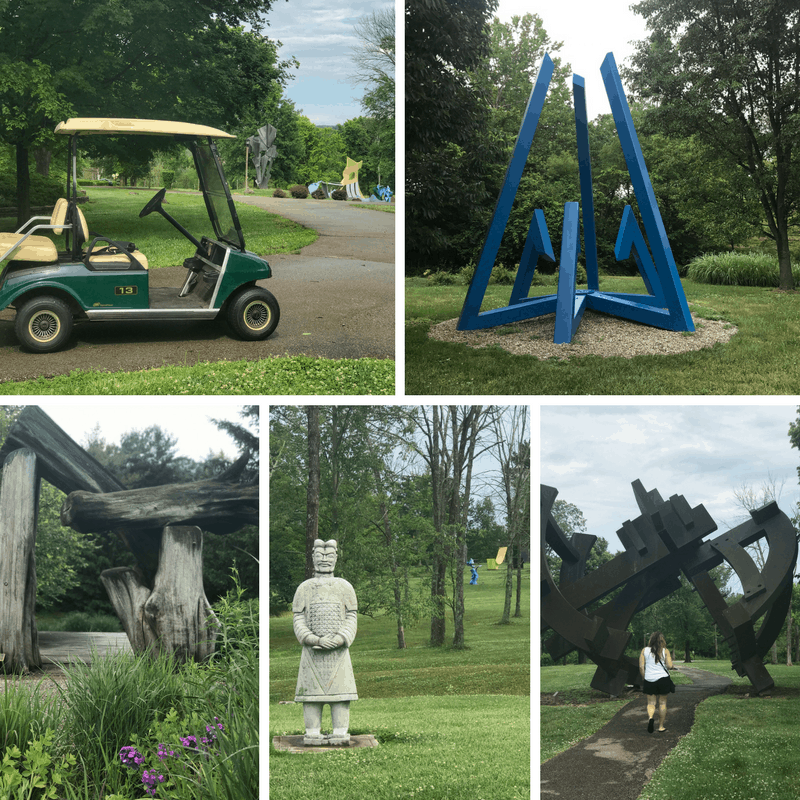 A visit to Pyramid Sculpture Park includes a visit to the 10,000 sq. ft Ancient Sculpture Museum filled with sculptures thousands of years old. 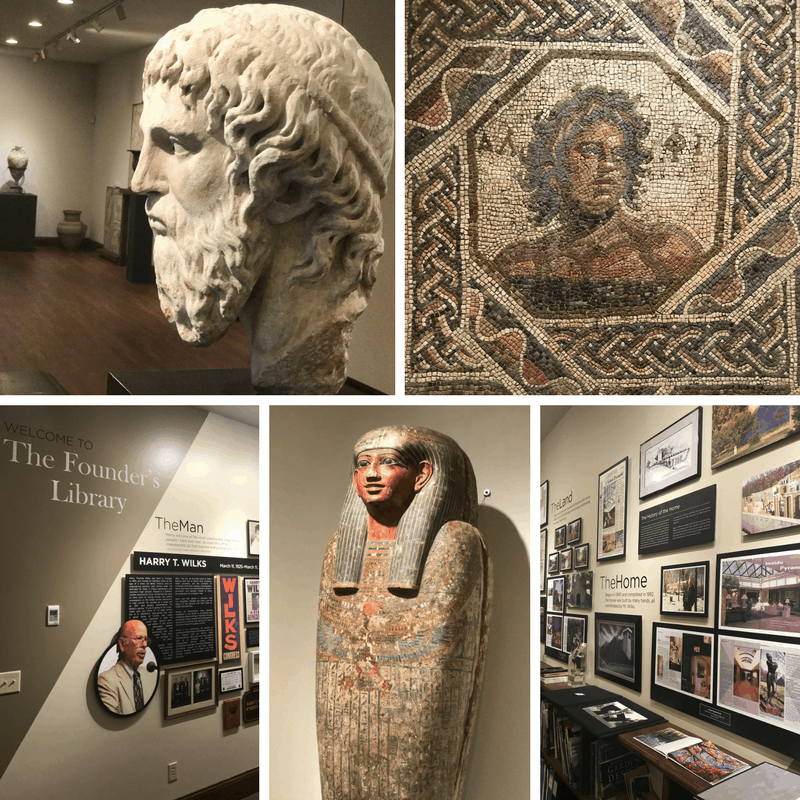 The collection of Egyptian, Greek, Roman and Etruscan sculpture is really impressive! Inside the museum there is a founder’s library where you can learn more about the founder, Harry T. Wilks. I was fortunate to meet him a few years ago during a previous visit before he passed. During our visit my son was both the navigator of our cart and the photographer for several of the shots. This helped him engage more with his surroundings and take more interest in the art. Yes, that’s right. 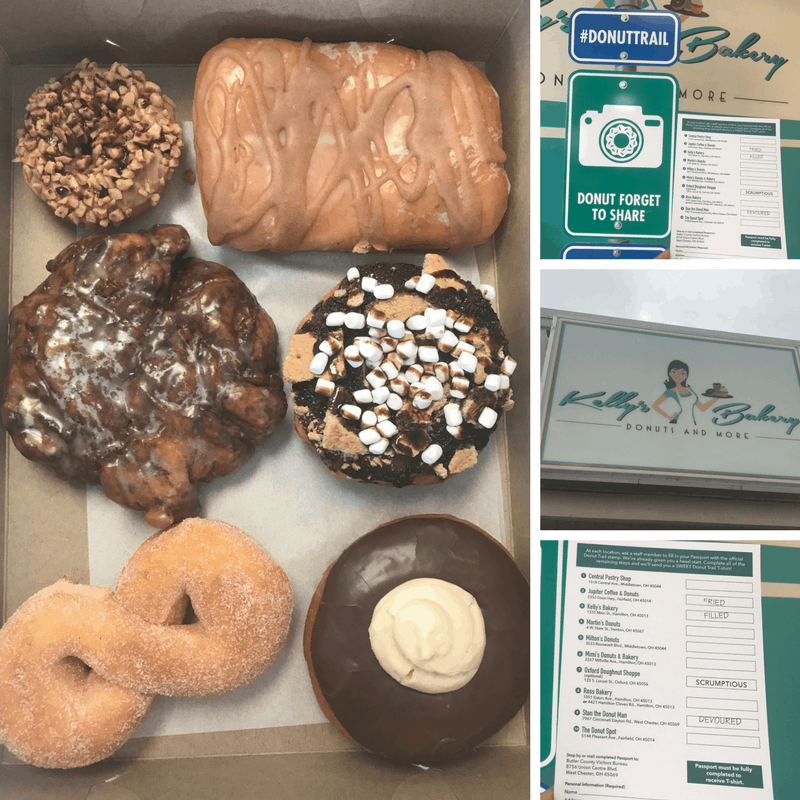 Butler County has a Donut Trail and 3 of the bakeries on the trail are in Hamilton; Kelly’s Bakery, Mimi’s Donuts and Bakery, and Ross Bakery. Complete your Donut Trail Passport with stamps from each stop and you can get a free Donut Trail t shirt at the Bulter Country Visitors Bureau. My kind of “research” and my kind of hiking trail! 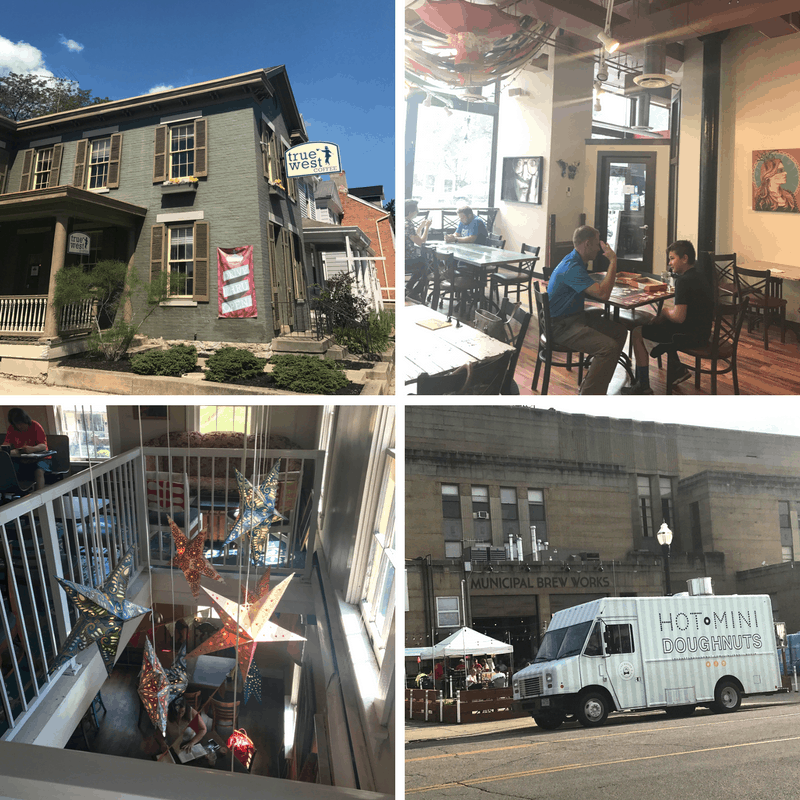 Coffee lovers can enjoy two welcoming locations at True West Coffee (they also serve great smoothies among other menu items.) You can watch my attempt to make latte art and learn more about their coffee with Chris the owner, here. Beer lovers can discover their favorite craft brew at Municipal Brew Works in a laid back atmosphere with a taproom, outdoor seating, visits from food trucks several days a week, and games. Purchase a unique gift or create your own. 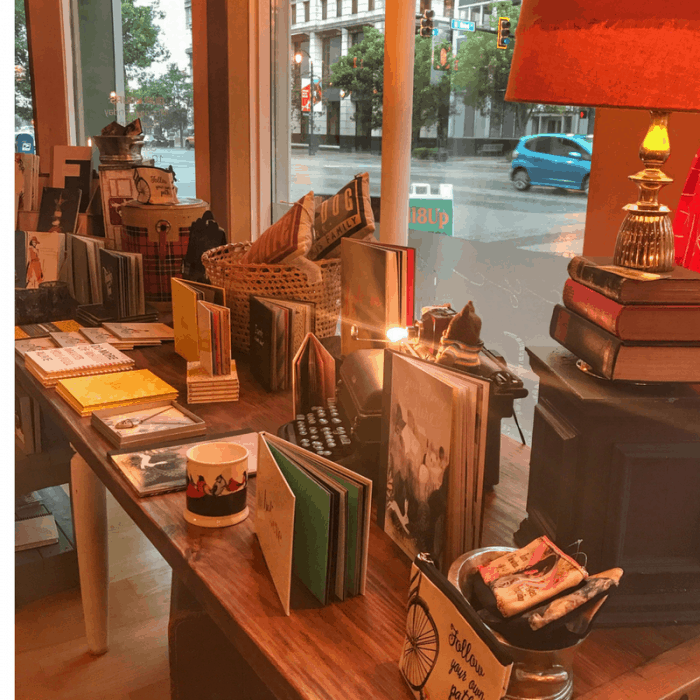 Downtown Hamilton has several shops that are worth checking out ranging from new, vintage, and repurposed. A few of our stops during our visit were to Secretly Shabby, Sarah’s House with unique lights made by her husband (their family also lives above the store in a beautifully designed space that mixes urban and vintage- seriously jealous of their floor plan, design skills, and downtown living), Pop Revolution, and The Studio. Next time I’ll check out more of the shops kid-free. 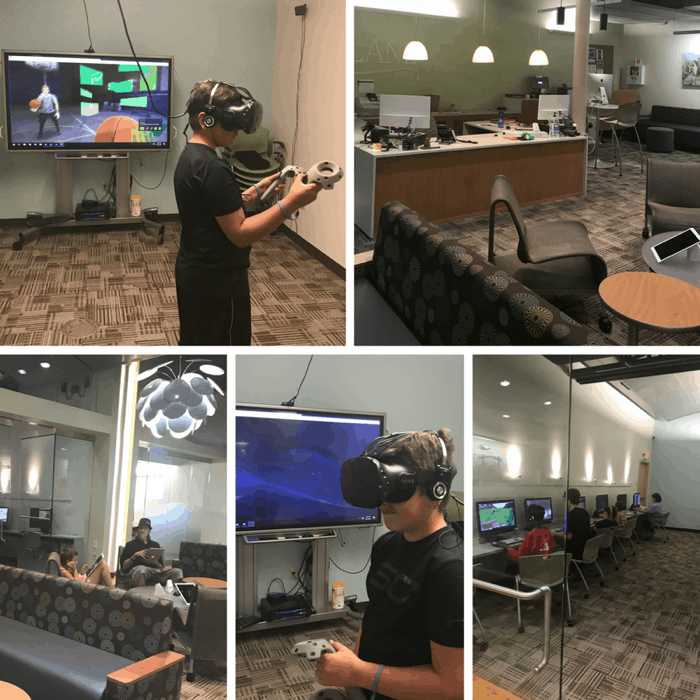 Experience VR (Virual Reality) Technology for FREE downtown at the Lane Community Technology Center. This library recognizes that as the culture changes, the library can serve the needs of the community by offering accessible technology. You can reserve the VR room (This is fun for adults too! Watching someone play is almost as entertaining as playing), use both PC and Mac computers, high-end software, tablet and eReader demo displays, and 3D printers. Sign up for free classes to sharpen your skills or to learn something new. The atmosphere is relaxed with lounge-style seating and free wifi. During our visit we stayed at the Courtyard by Marriott located next to the Great Miami River, RiversEdge Park, and across the street from Municipal Brew Works. 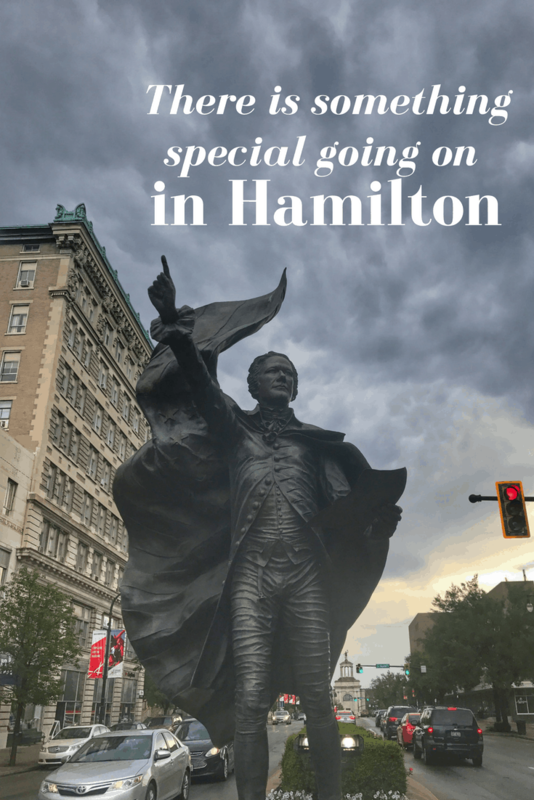 You can easily park once and walk to most of the points of interest around downtown Hamilton. The vast majority of the people that I encountered are committed to seeing positive changes in the city of Hamilton and they are putting their dollars into the local economy to show it. 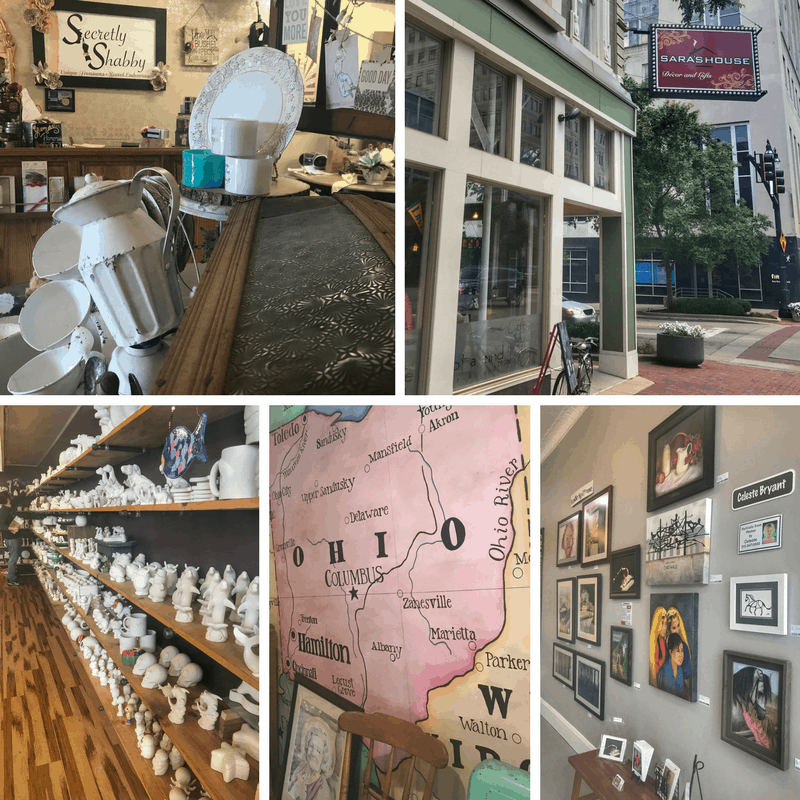 They are sharing their passions in downtown shops and eateries. I met people who grew up in the area that have witnessed the shift back to downtown and I also met people who specifically moved to Hamilton from larger cities to be a part of the revitalization. There will always be naysayers but I believe this community gets the power of supporting the local economy. After a few days of experiencing a small taste of the community, I get it, and I believe in Hamilton too. Thanks to Butler County Visitors Bureau for hosting my visit. If you come back go to All8up that is around the corner fromHigh Street Cafe. The food, prices, and atmosphere are awesome. I’ll have to add it to my list. Thanks for the tip! Thanks for believing in us too! I’ve loved watching my community grow, and I’m thrilled with where we are headed. We love our city ?? And for more insights into the art, both in town and at Pyramid Hill (as well as in nearby Fairfield) you should get the free mobile app called Otocast, which has audio narratives provided by, for the most part, the artists themselves. It provides wonderful insight to the pieces and their surroundings. Thank you for the reminder about the app! I just added that detail to the article. 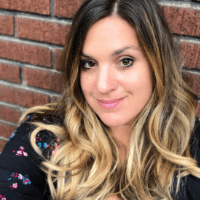 What a great article, Nedra! Thanks for writing about my hometown so well! I’m proud to say that I was born and raised in Hamilton, and while I now live in Minnesota, I return to Hamilton regularly to visit my relatives who still live there. 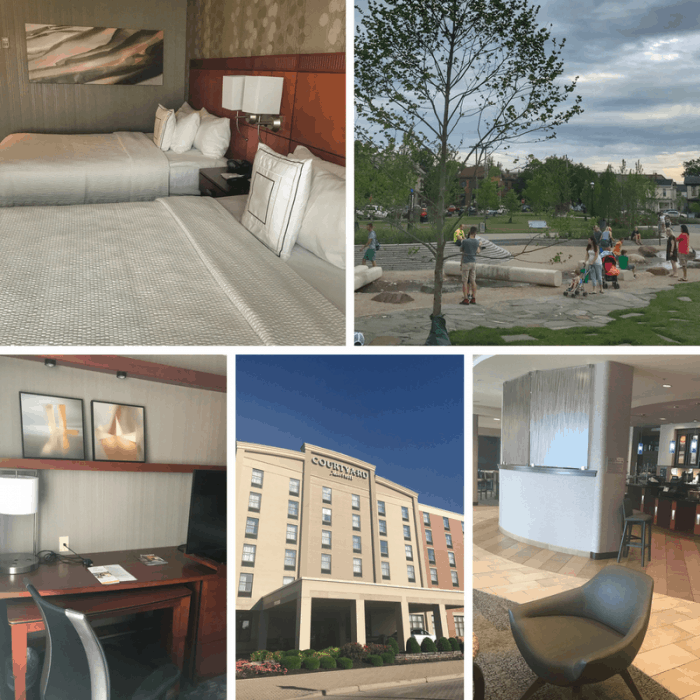 I am always excited to see the newest improvements whenever I visit! Yay for Hamilton! What a TERRIFIC and happy article Nedra!! Thank you for pointing us to the beauty of our town?????? Hamilton is also home to a world class professional symphony orchestra in the Butler Philharmonic. Been here since 1951, and home to the only Mozart Festival in the midwest. I’ll have to add it to the list during my next visit. My great grandfather,Henry Holbrock, arrived in Hamilton in 1847, so the Holbrock family has seen the many changes that have transpired. We are definitely transforming the City into a vibrant community that is being noticed. After many decades people want to travel west of Route 747 to see Hamilton and to relocate to our City. Let’s continue this change and perception. We have exceptional leaders with great vision at the present time. Y’all obviously didn’t visit the East end. Nor were you aware that drug usage is horrible on both ends of Hamilton. You saw some sights, but you didn’t really “see” Hamilton. As in every other city! 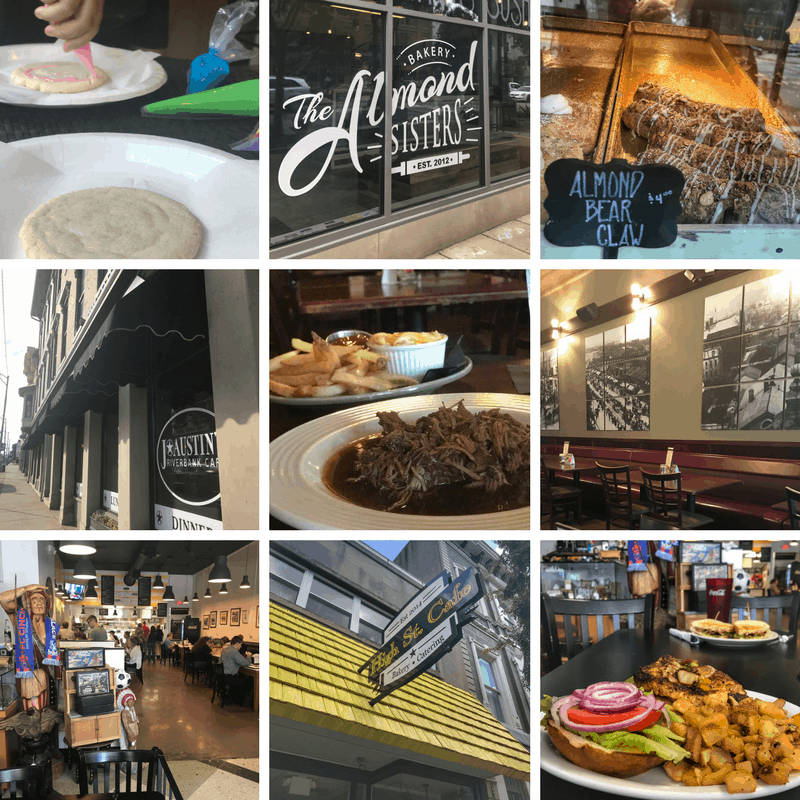 Hamilton isn’t a Utopia,it’s like every other city,with its ups and downs.They are showing the up side of Hamilton. Even the most beautiful rose still has thorns,yet does one stop enjoying the blossom? Hamilton has been on my radar for a few months now. I need to plan a trip to explore! We visited Hamilton County several years ago…but it looks like there is so much that has come there in the recent past that more than merits a return trip! Check out the Artspace Hamilton Lofts as well!